· Add the detailed error hint. · Launch EOP Video Recorder V1.0.8.20. 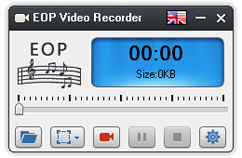 EOP Video Recorder is the free computer video recorder software, it can clearly record the pictures from computer and camera, and then output them to be WMV format. EOP Video Recorder is specially developed by EOP development team for numerous EOP lovers who can share their EOP video works. Via it, you can easily record the EOP video works and upload them to the popular video sites, and instantly thousands of net friends can watch your video online. 4. If you do not find the "Stereo-mixing", which proves your sound card driver is not the newest version, please update it.